Today we are talking about how to clean granite counter tops for less with this homemade granite cleaner. 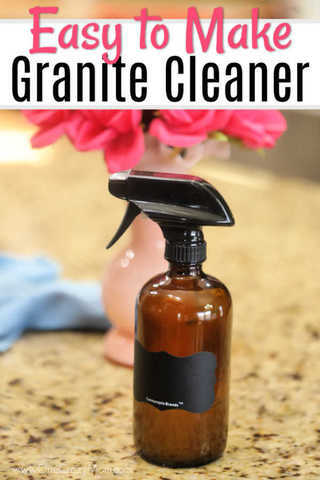 We have been using this homemade granite cleaner for over a year and I’m finally taking the time to show you how easy it is to make! You are going to love how great it works and how easy it is to make. It is a win all around and frugal as well! Once you start making homemade granite cleaner, you will never buy this again at the store. I am confident you will love how well it cleans your granite counters. Plus, you don’t have to worry about a ton of chemicals and such. I love making my own products. What is the best homemade cleaner for granite? The key to a good homemade granite cleaner, is rubbing alcohol. The reason is many cleaners streak really easily and if granite isn’t cleaned properly it can look really dirty and ugly. Once you know what to clean it with and how to do it, it is simple. Your granite will be shining! No need to buy expensive products at the store when this works so well. You will love it. It feels so good to be able to use really good products that clean so well but do not cost an arm and a leg. Your budget will thank you! Combine all the ingredients in your 16 oz spray bottle and fill the rest of the way up with water (about 2 cups) and give it a shake. Make sure you give it a quick shake before you use it each time. 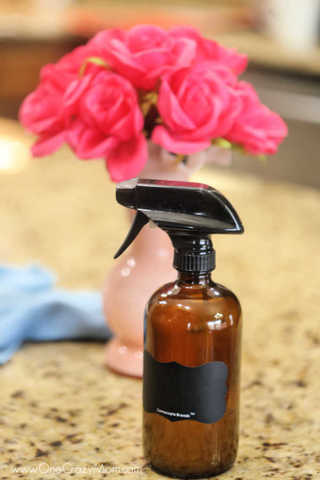 Let’s take a minute to talk about how to clean granite counter tops with our new homemade granite cleaner. It is so easy, even my kids can do this! You can have beautiful counter tops without spending $8 per bottle of granite cleaner. That really adds up over time when you think of all the cleaners you buy. How do you make granite countertops shine? Remove everything off the counter. Spray down the counter tops with your homemade granite cleaner. Wash and scrub with a microfiber cloth. I bought some on amazon for cheap and I love them! I use them for all kinds of cleaning! Enjoy your beautiful shiny granite counter tops. See I told you it was easy to make this granite counter cleaner recipe! 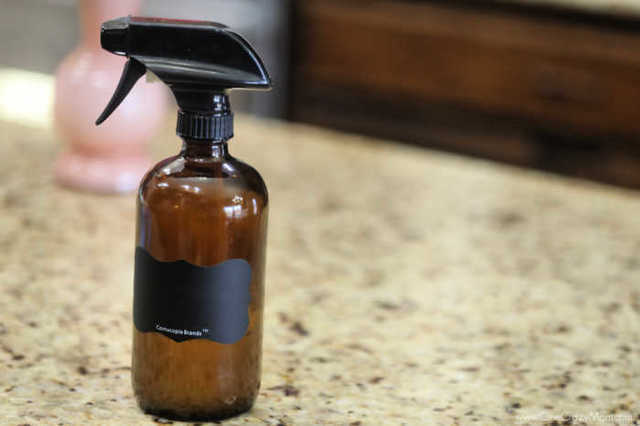 Now this homemade granite cleaner is going to cost you around $.50 to make each bottle (at the most). Don’t you think that is much nicer than the $8 it cost for a store bought granite cleaner? I know I like this price much better to keep my granite countertops clean. The granite surface will be shiny and new after using this diy granite cleaner. We love making homemade cleaners instead of always grabbing store bought cleaners. Homemade cleaning products work just as great and save a ton of money. Plus, you know exactly what is going into your products to clean your granite and other items. 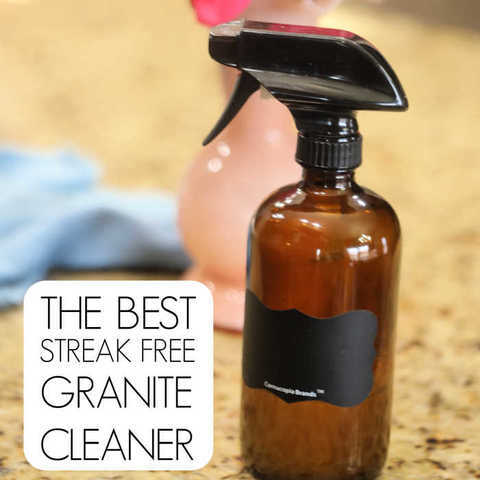 Let us know how you like this homemade granite cleaner. It does not leave streaks and works better than any all purpose cleaner you can purchase for natural stone and more. Is it OK to use vinegar on granite countertops? Vinegar is not recommended for use on granite counters. This is due to continued use over time dulling the shine of the granite. Stick to our diy recipe for granite cleaner and you will be good to go. This is a great tip to streamline all that needs to be done. Everyone can help and really get the chaos and clutter reduced. We love DIY cleaning recipes! I feel much better knowing I am not bringing that in my home. Our budget is better because of all these great cleaners I am making and everything works so well. Start with a few cleaners and go from there. 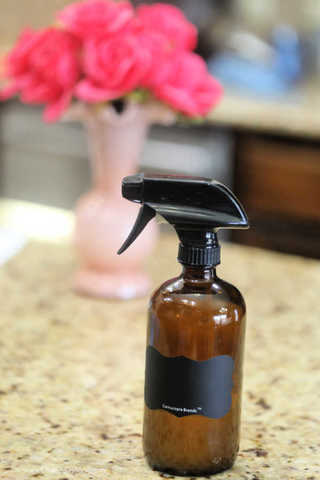 You will love making homemade cleaners and no longer having to go to the store to buy all sorts of products. It is a win all around and you will love it! Get started today!